The Food and Drink Federation and the Food and Drink Exporters Association last week announced their quarterly stats for the third quarter of 2017. 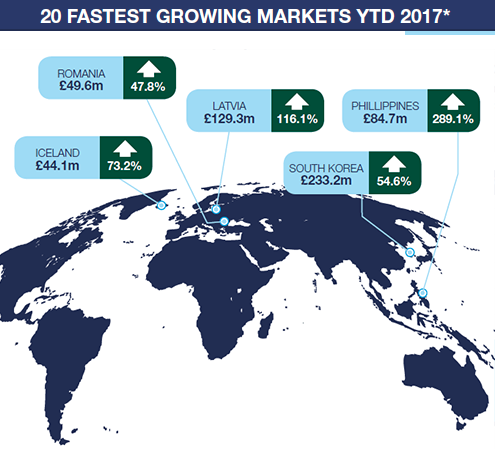 Exports in the industry have gone up 14.7% up this year in 2017 – up to £5.9 billion – with growth to non-EU markets outperforming growth to EU markets (18.2% to 12.5%). This growth in non-EU share is particularly pleasing given obvious concern around Brexit. However, the food and drink trade deficit did increase by 0.7% in Q3. There was particular growth in the exports of branded goods – up 12.7% to £4.3bn. There were was also reported growth amid several product categories in the sector, with 9 of the top 10 exported products increasing. Ireland remains the top export market, up 12%, followed by France and the USA. We will be back in 2018 with further updates and features for the industry.